What is the cost of one hour of downtime to your business? IBM Z delivers availability and business continuity tailored to your needs – on prem or in the cloud. What is IT infrastructure resiliency? When mother nature strikes, the local electric grid fails, or human error/malice disrupts operations, every business is at risk for revenue loss, fines and competitive exposure. But in a 24/7/365 world, disruptions are not tolerable. Your IT resiliency is your ability to adapt to planned or unplanned events while keeping services and operations running smoothly and continuously, on prem or in the cloud. Hardware, operating systems, middleware and workloads available. Restored with minimal loss and optimal integrity. Able to operate even in the event of an outage. The risks of service disruption are mitigated. Why IBM Z for resiliency? Whether you are running a private or public cloud, IBM Z offers superb qualities of service for on- and off-prem. IBM Z customers report an average annual downtime of less than one minute of unplanned per server, per annum, outperforming all other platforms. (1) That’s 99.999% uptime. IBM Z remains available – even during earthquakes and uses automation to speed human reaction time and remove human-error incidents. New computing models like AI, machine learning and containers enhance availability. Of ITIC survey respondents, 60% say increased workloads negatively impact reliability. (3) IBM Z can respond to workload increases while meeting service requirements. Businesses of any size can realize the benefits of shared-everything scalability, capacity on demand, and flexibility across internal, external, and microservices platforms. So that your operations can run at their optimum, network, server, application, and data layers are not only available, but also generate required accounting statistics, thus meeting regulatory requirements to avoid any potential data or process fluctuations. See if your systems are running at optimum. Build IT on the most secure, available and resilient servers. Run continuously and with the fastest RTO and RPO solutions available. See what is possible with a more secure and reliable operating system. See how you can achieve zero downtime and sleep well at night. Achieve your defined goals for disaster recovery and high availability. 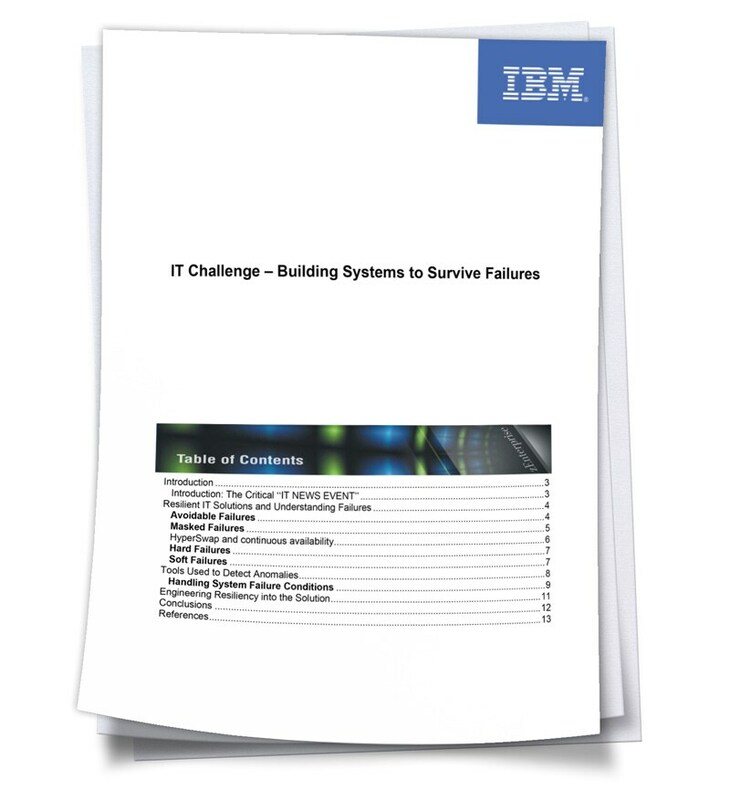 What can IBM Z do to build your business resiliency?